Next time you need a baby gift that’s sure to elicit “oooohs” and “awwwws,” look no further than Weepereas’ handmade baby shoes and bib gift sets. Each item is handmade by a Wisconsin mom, and her bold yet whimsical cotton fabric choices will put a spring in baby’s step this season. The shoes are all reversible, with a coordinating solid color inside, and bibs are backed with chenille fabric. Next time you need a baby gift that's sure to elicit "oooohs" and "awwwws," look no further than Weepereas' handmade baby shoes and bib gift sets. Each item is handmade by a Wisconsin mom, and her bold yet whimsical cotton fabric choices will put a spring in baby's step this season. 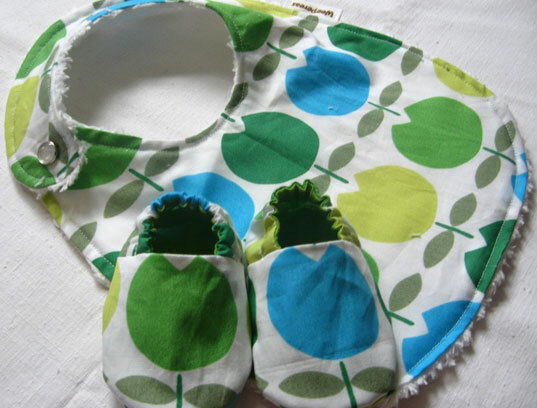 The shoes are all reversible, with a coordinating solid color inside, and bibs are backed with chenille fabric.